The team is using Hubble’s powerful vision to scour the Pluto system to uncover potential hazards to the New Horizons spacecraft. Moving past the dwarf planet at a speed of 30,000 miles per hour, New Horizons could be destroyed in a collision with even a BB-shot-size piece of orbital debris. “The inventory of the Pluto system we're taking now with Hubble will help the New Horizons team design a safer trajectory for the spacecraft,” added Alan Stern of the Southwest Research Institute in Boulder, Colo., the mission’s principal investigator. 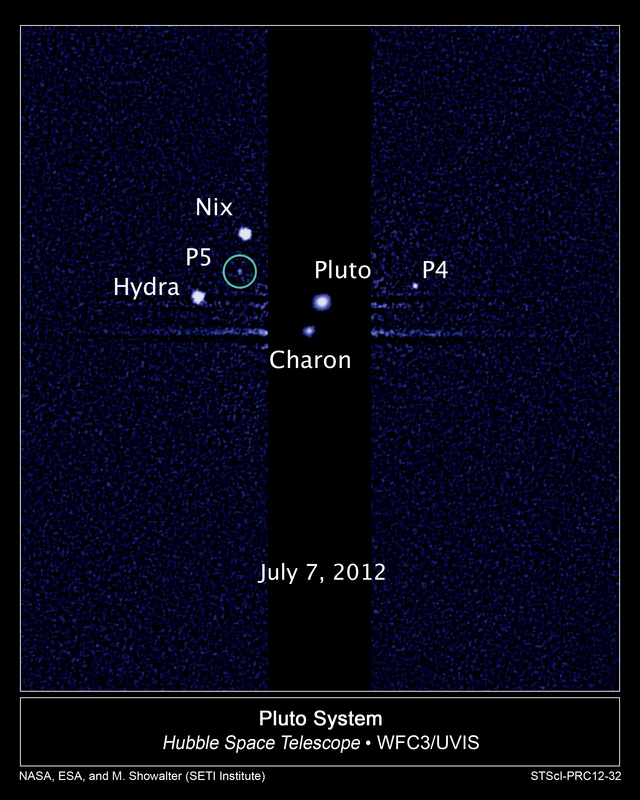 Pluto’s largest moon, Charon, was discovered in 1978 in observations made at the United States Naval Observatory in Washington, D.C. Hubble observations in 2006 uncovered two additional small moons, Nix and Hydra. In 2011 another moon, P4, was found in Hubble data. Provisionally designated S/2012 (134340) 1, the latest moon was detected in nine separate sets of images taken by Hubble’s Wide Field Camera 3 on June 26, 27, 29, and July 7 and 9. In the years following the New Horizons Pluto flyby, astronomers plan to use the infrared vision of Hubble’s planned successor, NASA’s James Webb Space Telescope, for follow-up observations. The Webb telescope will be able to measure the surface chemistry of Pluto, its moons, and many other bodies that lie in the distant Kuiper Belt along with Pluto.